Nuevo Latino Cuisine specializing in Full Service Catered Events including Staffing, Mojito Bars, Sangria Bars & Full Cocktail Bars, Rental Coordination & Decoration. Let our California-Cuban Cuisine be the hit at your next office function, social gathering or wedding. 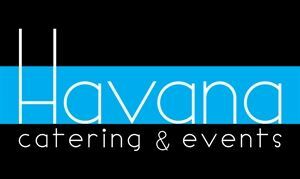 Havana, a 5 star rated Yelp user, is available to cater events as small as 6 guests or as large as 300+. For our Yelp rating, please click the link below "Testimonials". We provide assistance with menu planning, rentals and staffing. • Box Lunch #1 - $10.95 per person Sandwich & Salad - select up to 3 different sandwiches and 1 salad for your group. box lunches include napkin and utensils. • Box Lunch #2 - $11.95 per person Sandwich & 2 Side Dishes - select up to 3 different sandwiches and 2 side dishes for your group. box lunches include napkin and utensils. Please review our attachment for menu selection. Package includes: • Select 1 Salad • Select Up to 3 Sandwiches • Select 1 Side Dish Please review our attachment for selection of salad, sandwiches and side dish. Package includes: Cruzan Silver Rum, 2 Fruit Purées (your choice), Mint, Lime Juice, Fruit Garnish, Straws, Cocktail Napkins, Cooler of Ice. Fruit Puree Options: Mango, Pomegranate, Raspberry, Colada (Coconut & Pineapple), Watermelon Open Mojito bar is available for up to 4 hours. Please review our attachment for complete package details. • Light Tapas Party - $11.95 per person Select a variety of 4 tapas from our tapas menu. Light tapas will provide your guests with 6 pieces of appetizers per person. • Heavy Tapas Party - $17.95 per person Select a variety of up to 6 tapas from our tapas menu. Heavy tapas will provide your guests with 10 pieces of appetizers per person. Please review our attachment for complete package details. Package includes: • Select 1 Salad • Select 2 Entrees • Select 2 Side Dishes Please review our attachment for selection of salad, entrees and side dishes. Package includes: • Select 2 Tapas • Select 1 Salad • Select 2 Entrees • Select 2 Side Dishes Please review our attachment for selection of Tapas, salad, entrees and side dishes. Package includes: • Select 1 Salad • Select 2 Entrees • Select 2 Side Dishes • Desserts can be added ‘a la carte’ Please review our attachment for selection of salad, entrees and side dishes.